Gardeners new to orchid growing soon realize that healthy orchids don’t grow in regular potting soil. It's too dense, doesn't drain thoroughly enough, and most orchids actually grow in the air—the medium is just there to give the roots something to cling to. Beyond that, the various choices available in orchid potting materials can be confusing. Many orchid cultivars can grow in a one-ingredient medium and some varieties prefer only certain materials. You can make your own custom orchid mix, but you first need to become familiar with the needs of your particular plant. And, there are many high-quality orchid growing mixes that offer a variety of benefits, depending on the media included. With all of these options, cost, availability, and appearance may help you narrow down your choice. To help you decide, it's good to learn about the properties of each type of material. Brick chunks add weight and stability to heavy orchid pots. However, you will want to find smaller sized pieces since it can be so heavy. This material is somewhat water retentive, which increases the humidity for your orchids. Cobblestone also works well as an anchor in the bottom half of an orchid pot. The small, uneven rocks are heavy, which helps top-heavy orchids like dendrobiums stay upright. Cobblestone will not retain water, so you'll need help to increase the drainage properties of your orchid mix. You can use coconut coir—the fibrous middle core surrounding the fruit—alone or as part of a custom orchid mix. The long fibers absorb moisture, but also drain quickly, so orchid roots experience moist but not soggy growing conditions. A renewable resource, coconut husk chips come in different sizes to meet your needs, whether that's as a standalone growing medium or a potting mix additive. The chips decompose slowly, ensuring maximum air circulation for orchid roots. Many orchid growers also use coco husk fiber plaques, which provide an excellent substrate for growing orchids on mounts. Anyone with a vintage bottle of wine is familiar with the watertight qualities of cork. You can mix water-shedding cork with water-absorbing sphagnum moss or shredded bark for an ideal orchid mix. The larger cork chips offer many crevices for orchid roots to explore. Some orchids come in a potting mix that includes rocks which look very much like Cocoa Puffs cereal. If you notice these, it's very likely that you purchased a plant grown in an expanded clay aggregate like Aliflor or Hydroton Clay Pebbles. Unlike regular rocks, these ceramic pebbles are porous, lightweight, and are neither acidic nor alkaline. You can use them alone, mix them with other growing media, or use them as a mulch on all of your orchids to give the pots a uniform appearance. You will commonly see this inorganic growing medium used in orchids imported from Hawaii. Like other rock growing media, lava rock won’t break down and is a good potting mix amendment for orchids that don’t like to have their roots disturbed. Lava rock retains water and that, in turn, increases the humidity for your orchids. Perlite, also known as sponge rock, is actually the end result of volcanic glass exposed to high heat. Although perlite doesn’t contribute any nutrients to orchid plants, the substance has excellent water retention and aeration properties. It's also a very easy medium to find because most nurseries and garden centers keep it in stock as a general soil amendment. Pumice has many fans for its polishing potential on rough skin, but this volcanic rock is also a lightweight inorganic growing medium for your orchids. The rock is highly porous and holds up to 50 percent of its weight in water. It's also quite lightweight, so it won't weigh your plant down. Rock wool (also spelled rockwool) is the cotton-like fibers of chalk and basalt that can be found in better gardening stores or online. Its big advantage is that it will never break down in your orchid potting mix. You will, however, need to balance the alkalinity of rock wool cubes with an organic ingredient like bark or peat moss. Shredded bark from trees like fir, cedar, and cypress. 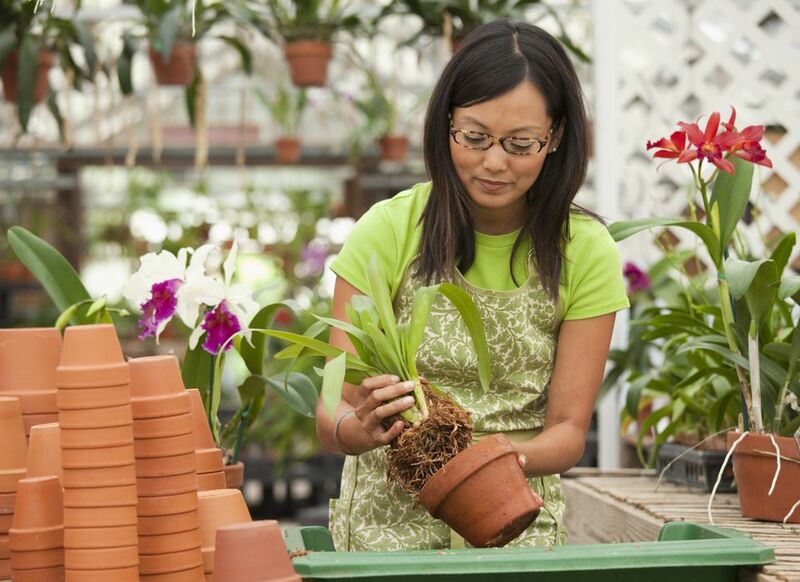 It is among the most common materials in orchid pots, especially those sold in flower shops and nurseries for beginners. Bark will acidify your orchid mix as it breaks down. It is also favored for its natural look and pleasant fragrance. Yet, orchids that are growing in a bark medium may need repotting once a year. Weed- and pathogen-free sphagnum moss maintains a moist environment for your orchid roots. It won't become soggy, though, which is why it's a popular choice. Often sold in compressed bricks, you will need to rehydrate the moss and pack it loosely into your orchid pot for best results. Orchids that like periods of dryness may thrive when grown in a Styrofoam medium. Simple Styrofoam peanuts can work as a growing medium and are an eco-friendly option, giving you a chance to recycle the common packing material. You can also buy special Styrofoam pellets, such as Aerolite, which are produced specifically for epiphytic plants like orchids. Vermiculite is commonly found at garden stores that sell a variety of potting soil amendments. It's also often found in many ready-made potting soil mixes, appearing as gravel-sized particles. This light-brown mineral has good water and nutrient retention properties. Vermiculite helps aerate a potting mix as well. It combines well with sphagnum moss to create a light, moisture retentive orchid mix. As Soon as the Soil Can Be Worked: What Does That Mean?